JRPG Jungle: Deals Ahoy! : This Week's Humble Bundle Is Full Of Japanese Games! Deals Ahoy! 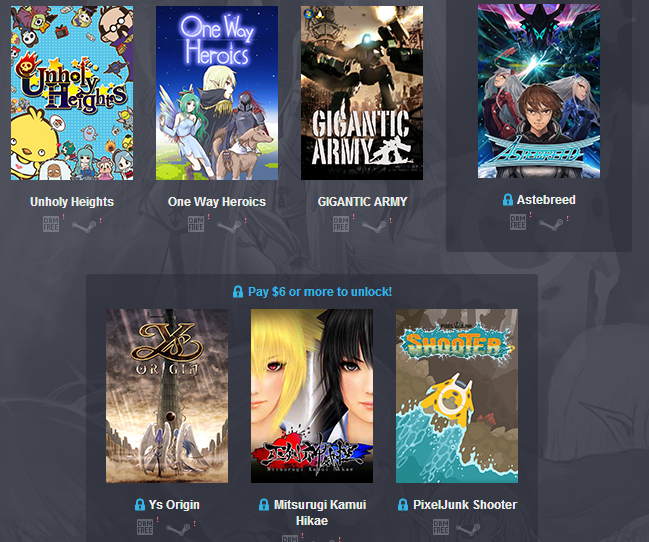 : This Week's Humble Bundle Is Full Of Japanese Games! Want to get a bunch of new games and do something nice for charity? Humble Bundle allows you to do just that once a week, offering a bundle of games on a pay-what-you-want basis and giving more games the more you pay. This week's bundle has a fitting theme for this site: Japanese games! There's something here for everyone: you have JRPGs, casual fun games and robots. You can pay-what-you-want for the first three games, but it's only $10 if you want everything that's on offer. A list of the games included is below, plus a link to the bundle. Check it out at https://www.humblebundle.com/weekly.